Ti2 Titanium white card box gift boxes printed with turquoise foil. For use with Ti2 titanium jewellery. Comes with white wadding. 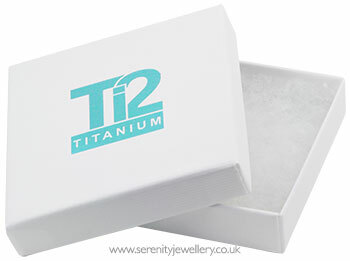 Please note: These boxes will only be sent with orders for Ti2 titanium jewellery. Due to the size maximum quantity is one box per order. Great quality, I bought a Titanium chain for my mom and the box really made it a great gift!